Flange Gaskets are used to create a static seal between two flanges faces, at various operating conditions, with varied pressure and temperature ratings. A gaskets fills the microscopic spaces and irregularities of the flange faces, and then it forms a seal that is designed to keep liquids and gases. Correct installation of damage-free gaskets and demage-free flange faces is a requirement for a leak-free flange connection. If it would be technically possible, in order to manufacture flanges perfectly flat and smooth, and perfectly compatible with one another under all operating conditions, a gasket would not be necessary. But in normal practice it is not possible, because flange connections under ANY circumstances should be made. Small impurities and a small bit of dirt, is in practice not be avoided and therefore it is necessary to use a gasket. ASME B16.21 covers types, sizes, materials, dimensions, tolerances, and markings for nonmetallic flat gaskets for pipe flanges. ASME B16.20 covers metallic and semi-metallic gaskets for pipeline flanges. The flange gasket should not be affected by the fluid conveyed by the pipeline over the whole range of operating conditions (pipeline operating temperature and pressure). The chemical resistance chart shows how different flange gasket materials resist specific temperatures, pressures, and fluids. Butyl -40 to 225 150 1/16 to 1/4 Gases, inorganic acids & alkalis. Excellent weather/abrasion resistance. EPDM -40 to 212 150 1/16 to 1/4 Water, steam, animal/vegetable oils, oxygenated solvents. Excellent weather resistance. Natural (Pure Gum) -20 to 140 100 1/32 to 1 Acids, organic salts & alkalis. Non-toxic. Abrasion resistant. Soft. Neoprene -20 to 170 150 1/32 to 2 Oil/gasoline. Excellent weather resistance. Neoprene – Cloth Inserted -20 to 170 150 1/32 to 1/4 Oil/gasoline. Excellent weather resistance. Handles movement. High tensile strength. Nitrile (NBR, Buna-N) -25 to 170 150 1/32 to 2 Oil/Aromatic fuels, mineral, animal and vegetable oils, solvents and hydraulic fluid. Available in commercial, premium and FDA grades. SBR (Red Rubber) -20 to 170 150 1/32 to 1/4 Air, hot/cold water. SBR – Cloth Inserted -20 to 170 150 1/16 to 1/4 Air, hot/cold water, saturated/ low-pressure steam. Excellent for high compression loads. Handles movement. Silicone to 400 150 1/32 to 1/4 High-temperature air or water (not oil or steam). Soft. Available in FDA grade. Viton to 400 150 1/32 to 1/4 Oil/Aromatic fuels, mineral, animal and vegetable oils, solvents and hydraulic fluid. mild organic acids/alkalis. Excellent aging properties. Non-Asbestos/Hypalon 400 900 40 Strong organic & inorganic acids/oils/aromatic hydrocarbons, powerful oxidizing agents. Non-Asbestos/Neoprene 800 1200 15 Fuel/oils. Good general purpose material. Non-Asbestos/Nitrile 800 1500 15 Steam/oil/fuel/solvent. Excellent general purpose material with wide chemical resistance. (with metal insertion) 850 2500 15 Hot gases. High load/stress environments. Available with galvanized low carbon steel foil or mesh insert. Non-Asbestos/SBR 800 1500 15 Steam/industrial gases. Pure PTFE 500 800 35 – 55 Excellent chemical resistance. Filled PTFE 500 1200 11 – 40 Excellent chemical resistance. Filled PTFE – Metal Inserted 500 2500 20 Excellent chemical resistance. 316 SS perforated core. Expanded PTFE 600 3000 30 Excellent chemical resistance. Highly compressible. Carbon or Graphite/Nitrile 840 1900 20 Excellent for steam. Excellent chemical resistance except for powerful oxidizing agents. Carbon or Graphite/SBR 900 2000 14 Excellent for steam. Excellent chemical resistance except for powerful oxidizing agents. Pure Flexible Graphite 950 2100 5 Excellent chemical resistance except for powerful oxidizing agents. Available laminated or homogeneous. Pure Flexible Graphite – Metal Inserted 950 2800 7 Excellent chemical resistance except for powerful oxidizing agents. Available with 316 SS Foil, Mesh or Tang Core. Available laminated or homogeneous. Copper 600 Excellent for steam. Excellent chemical resistance except for powerful oxidizing agents. Brass 500 Excellent for steam. Excellent chemical resistance except for powerful oxidizing agents. GHL 212 Excellent chemical resistance except for powerful oxidizing agents. Available laminated or homogeneous. Grafoil ® 800 Excellent chemical resistance except for powerful oxidizing agents. Available with 316 SS Foil, Mesh or Tang Core. Available laminated or homogeneous. Titanium 1000 Similar strength to 300 series stainless, but tougher and much less dense. Excellent resistance to chloride solutions (sea water) and bleaching solutions. Soft Iron, Low Carbon Steel 1000 Soft. Will corrode in water. Mostly used where immersed in liquid hydrocarbons. 1000 A general-purpose, soft, corrosion-resistant, non-magnetic stainless that will not harden under heat. 1600 Stronger than 304. Used when similar performance to 304 is needed at higher temperatures. 1600 More corrosion-resistant and harder than 321. 1200 Commonly referred to as “Chrome”. This stainless will harden when heat-treated. It is highly magnetic, hard and strong, but not very corrosion-resistant. 1400 More corrosion-resistant than 410, but will not harden when heat-treated. This stainless is soft and no stronger than 300 series stainless. Nickel 1400 Exhibits good corrosion and erosion resistance at moderate temperatures. Monel® 1500 A family of nickel/copper alloys that offer greater corrosion and erosion resistance than nickel alone. Particularly useful in seawater applications. Inconel® 2000 A family of nickel/chromium alloys that are non-magnetic and take corrosion resistance to elevated temperatures. The selected flange gasket should have a reasonable service life expectancy considering the most demanding conditions that the pipeline may experience (highest expected temperature-pressure conditions for high-temperature applications, and lowest temperatures for low-temperature applications). The temperature-pressure ratings of the common gasket materials are shown in the image below as a general reference. Gasket materials are designed to compress under load to seal the flanges. However, to retain such seal, the gasket should be able to keep a proper sealing surface and not creep significantly (an adverse phenomenon that may be activated by temperature). The flange gasket should be able to withstand the maximum pressure expected in the pipeline; this is often the test pressure, which can be at least 2 times the flange rating at ambient temperature. More and more stringent procedures and legislation are coming about in the field of allowed fugitive emissions, and such constraints shall be duly considered during the design of a pipeline and its flanged joints. e) Integrity: When the integrity of a gasket is of prime importance (e.g. when sealing a highly toxic chemical), the choice of the gasket may be influenced by the requirement for a larger safety margin. As an example, a spirally wound gasket with an outer retaining ring may be selected in place of a compressed asbestos fiber gasket. A non asbestos gasket (die-cut) is an economical type of gasket used to seal ANSI/ASME or EN flanges for low-pressure, low-temperature and non-critical applications. ASME B16.21 covers the dimensions and tolerances for this type of flange gaskets. Other types of gaskets, metallic and semi-metallic (such as ring joint gaskets, spiral wound, Kammprofile and metal jacketed) are under more demanding service conditions. Non Asbestos gaskets have fully replaced asbestos gaskets for decades as studies demonstrated the risks (for human health) associated with the production, use, and disposal of asbestos materials. The sizes, types, materials, dimensions, dimensional tolerances, and marking requirements for non asbestos gaskets are covered by the ASME B16.21 specification when it comes to gaskets for ASME B16.5 and ASME B16.47 flanges. The two main types of non asbestos gaskets are the “full face” (FF) for FF flanges and the “flat ring” type for raised face flanges (RF). Non asbestos gaskets are produced with compressed fiber sheets cut by water pressure machines. Non asbestos gaskets have dimensions ranging from 5 to 5.000 mm. Larger sizes are produced by joining multiple fiber sheets. The terms, “flat-cut gaskets”, “die-cut gaskets”, “compressed sheet gaskets” and “asbestos-free gaskets” are synonyms to define soft gaskets. Non asbestos gaskets can also be coated with graphite, for non-stick and steam resistance, mixed with PTFE for excellent chemical resistance, or with EPDM for potable water applications. For outside diameter NPS 12 and smaller: +0 / -1.5 mm. ; NPS 14 and larger: +0 / -3.0 mm. Spiral wound gaskets are “semi-metallic” gaskets whose sealing element is a metal strip filled with graphite, PTFE, ceramic fibers and, non-asbestos fibers (filler materials). The metal component of the spiral wound gasket provides strength to the seal, whereas the added fibers enhance conformability and resilience. Inner and outer rings can be added to the core sealing element to facilitate the installation and enhance pressure rating. The dimensions of spiral wound gaskets range from few mm up to 5.000 mm, and the typical thicknesses are 3.2, 4.5, 6.4, and 7.2 mm. A Spiral wound gasket may be ordered with different shapes, such as oblong, rectangular, oval, pear and diamond. The round type is, of course, the standard shape for raised face (RF), male-and-female (M&F), and tongue-and-groove flanges (T&G) for petrochemical applications. Flexitallic USA introduced spiral wound gaskets in the petrochemical market back in 1912 to cope with an increasing demand for leak-proof sealing solutions in applications with higher and higher (and fluctuating) temperatures and pressures. Spiral wound gaskets are designed to withstand the mechanical stress generated by severe service conditions of pipeline’s flanged joints with enhanced features than compressed fiber gaskets. Type 00: Spiral Wound Gasket without rings: they are used for tongue and groove, male and female flanges. Type 01: Spiral Wound Gasket with inner ring: they are used for male and female or special flange types. Type 10: Spiral Wound Gasket with outer ring: they are used for raised face flanges. Type 101: Spiral Wound Gasket with inner and outer rings: they are used for raised face flanges. Special Section: Spiral Wound Gasket with special rings: they are used for special flanges and special usage. 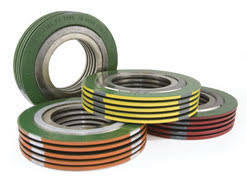 Each manufacturer, of course, has a specific way to code such configurations of spiral wound gaskets. The sealing element of a spiral wound gasket is produced by interleaving plies of alternating metal winding strip combined with a filler material. Such formed metal strip in the key sealing element of a spiral wound gasket. The filler material used for the metal strip is usually graphite, even if different materials such as PTFE, ceramic fibers, and non-asbestos materials may be used. The inner and the outer rings of a spiral wound gasket may be the same material of the winding core or a different one. Solid inner rings are required by the ASME B16.20 specification for flanges with pressure rating 900# NPS 24 and larger, 1500# NPS 12 and larger, pressure class 2500#, NPS 4 and larger. The inner ring improves the pressure rating of the spiral wound gasket, as it provides additional compression to the flanged joint and provides a heat and corrosion barrier protecting the gasket windings and the flanges from erosion. Use scrollbar at the bottom of table. The thickness of inner and outer ring: 2.97 mm – 3.33 mm. • Thickness sealing element: 4.45 mm. • Tolerance Outside diameter for NPS 1/2 through NPS 8 is ± 0.8 mm; for NPS 10 through NPS 24 tolerance is + 1.5 mm – 0.8 mm. • There is no class 400 flanges NPS 1/2 thru NPS 3 (use Class 600), class 900 flanges NPS 1/2 thru NPS 2½ (use Class 1500), or class 2500 flanges NPS 14 or larger.